Part of the aggressive style of pressing I love to use, is the way I make the forward line take to the field. Positioning properly is half the battle after all. What I want to achieve is that the opposition either hoofs the ball forward or plays it out to the wings, to make the wing-backs do the build-up play from the back. Effectively, I’ll be looking for moments like the ones below, which basically show-case the AI strategies regarding build-up play. This first match clip shows a goalkeeper opting for a long kick. With the defence pushing forward, there is no need to pressure the opposition back-line. The attacking midfielders naturally close down the defenders, my midfielders and defenders will try to pair up with opponents and they will challenge for aerial dominance. 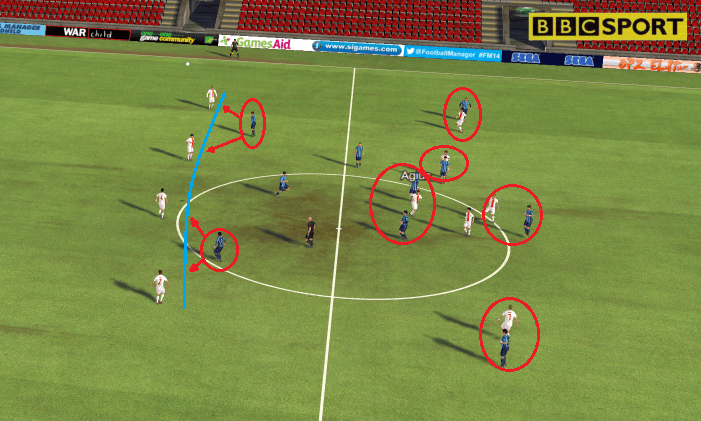 The blue line represents the defensive line, the red circles reprent my players pressuring opposing players. 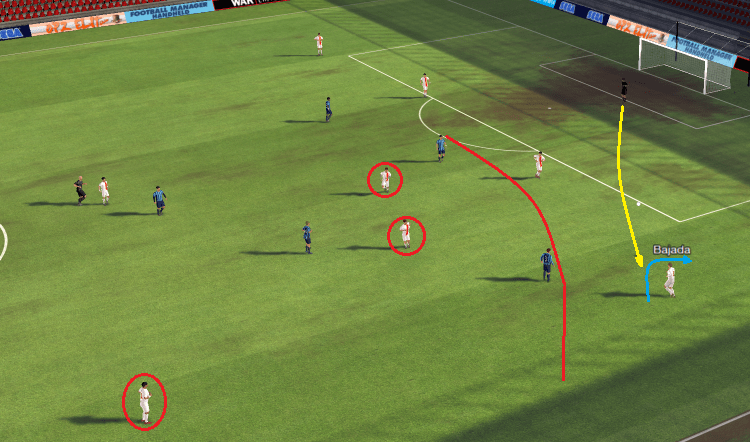 What I like from the above clip and screenshot is that the AMC, the Enganche, drops back into midfield to back up the midfielders there and make himself available as a recipient when one of my lads wins the header. With a more counter-attacking style, my players are less aggressive in their pressing, as shows by the average positions on the heat map, as shown in the post-match analysis. The average positions when using a counter-attacking style. So far, it’s nothing new. I have mentioned similar ideas before, including in my article for ClearCutChance. In this article I mentioned trying to shut down all passing routes, thus forcing a player into risky passes or just hoofing it forward. What I did notice is that my players are generally unable to keep this up for an entire match, especially not when your players are not world class and don’t always make the right choice on when to press and when to hold off and maintain a defensive stance. To try and correct this, I have opted for a more defensively sound option with three attacking midfielders. This means my players automatically cede the wings when playing an opponent who plays in a wide formation. This isn’t really a problem, as the next match clip will show you. The second clip is from the same match as the first one. Valetta, the team in red and white, had noticed their long ball strategy wasn’t paying off. Instead, they opted to drop further back and play a wider formation. With the three central attacking midfielders in place, the wing-backs are left wide open to receive the ball from the goal-keeper, which is just fine by me. Leaving the wing-backs open was an intentional ploy to exploit their weaknesses. Allow me to elaborate. The yellow line indicates the path of the ball, the red circles represent potential passing, the red line represents the pressing possibilities my players possess, the blue line represents the movement of the defender to receive the ball. As you can see, Valetta’s left wing-back, Bajada, has to turn towards his own goal to receive the ball, effectively limiting his passing options and bringing him closer to one of my more centralised players. Look at the realistic passing options Bajada has left. The two midfielders are easily closed down by one of my own midfielders as well as the attacking midfielders. The same goes for the central defenders. The winger further up the pitch could be an option, but with Bajada facing his own goal, there is a very real possibility he hasn’t noticed this passing option or is not able to swivel on the ball fast enough to play the pass before being closed down. With this being the Maltese league, most players lack vision and technique to pull off such moves and Bajada is no exception. We can see in the match clip he needs a few metres of space to actually control the pass, bringing him closer to my outter attacking midfielder, who promptly closes him down. Eventually, Bajada manages to find some space, but with all real passing options closed down, he has to hoof the ball forward. Allowing the wing-backs the time to receive the ball tends to lead to the wing-backs to simply hoofing the ball forward, because all passing options are blocked off. This means my team have to press less aggressively to achieve the same idea, which is a good idea in the later stages of a season or match, when your team tends tire faster.